I bought this book seven years ago because I was familiar with the name Lester del Rey, but I think I was most familiar with the name because of the publishing imprint whose juvenile science fiction books in library binding were a staple of my middle school years, at least at M. Gene Henderson Junior High. I don’t know that I’ve actually read any Del Rey, but given how much science fiction I read, particularly in my younger years, I might have. 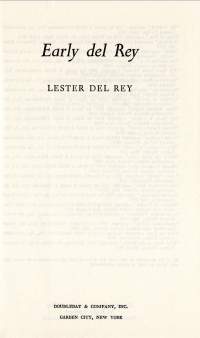 This book collects 25 short stories that del Rey wrote before he became a professional writer (that is, before he became a writer full-time). It’s more than a mere short story collection, though, as he writes almost as much memoir about the time period (the late 1930s through the 1940s) and his evolution as a writer during that time. He talks about writing not only for the science fiction magazines/pulps but also for other pulps in other genres, about the jobs he held during that period, and where he lived (part of the time in St. Louis). The author’s voice throughout connects the stories and provides now-historical context for writing in that era. I have been working on reading this collection of short stories for a while. I’d read one or two plus the connective memoir amid reading something else. I think this approach works best with me for short stories, as I have mentioned, because reading collections of short stories has some mental overhead when you have to reset your mind with each short story. So, 600 pages later and some months after I’ve read some of the stories, what sticks with me? More than I thought as I reflect on it, but perhaps not as much as one would hope for when consuming this much content. There’s a short story where a little bronze figure becomes sentient and self-aware through some Frankenstein processes coupled with a little Number 5/Edgar accidents, and the little bronze figure is friendly–as a modern reader, I fully expected a little golem to be malevolent, but not so in this book. There’s a short story about a man stranded on Mars by himself after an accident with his space craft which sort of reminded me of The Martian, but he’s helped my real Martians. There are a lot of planetary cataclysms and nuclear wars, which would have been the It thing right after the Soviets got the Bomb. The stories feature a lot of native Martians and even native Moon people that you don’t really get any more. I did flag a couple of points to make pithy comments. This is in “And the Darkness”, a story about one of the few remaining pockets of humanity living in a tiny valley in the Arctic hundreds of years after an atomic war. It also lists some facile sins of humanity, especially the west, in a very early sucker punch. And you know how I feel about Aztec “civilization”. To Fleigh’s relief, Slime tested the bed in sour displeasure, pulled a blanket off, and rolled up on the floor, leaving the flotation mattress unoccupied. He had as little use for such luxuries as his boss had for his presence in the same bed. Max climbed in and adjusted the speegee dial to perfect comfort with a relaxed grunt of pleasure. Lester Del Rey invents the Sleep Number® bed, but did not perfect the split that allows you to set the firmness on each side. I guess the adjustable couches were a staple of science fiction even then, though, so he did not invent it. This is from a story called “Unreasonable Facsimile” about an interplanetary intrigue that relies on kidnapping a planetary dignitary and creating an android replica for an important legislative meeting. Paul Ehrlich looked up from his wheat cakes in time to see his father exploding upward out of his chair and heading for the kitchen. The hero of the post-apocalyptic piece is named Paul Ehrlich. Del Rey might have named him after the physicist and not prophesied the rise of the doommonger of the 1960s. He [Paul Ehrlich] shook his head again, and went on splitting shakes off big pine blocks, while Henry began pounding the crookedness out of their small collection of rusty nails. This is the second book this year I’ve read with someone splitting shakes to roof a house; the other, of course, was Little House on the Prairie. “…Integrating the administration of an advanced technological world is inconceivably complex–even the men doing the job have only a vague idea of how complex! The broad policies depend o the results of lesser departments, and so on through fifty stages, vertically and in untold horizontal subdivisions. Red tape isn’t funny; it’s necessary and horrible. Complication begets complication, and that begets disconnection from reality. Mistakes are made; no one can see and check them in time, and they lead to more errors, which lead to war. That’s a pretty good summary of it, ainna? I’ve heard a lot of criticism against agents who charge reading fees to unknown writers, and I had some doubts about the practice myself. But I’m now convinced that it is a necessary and valuable service. True, a lot of would-be writers gain nothing for their money; that’s true in any training course, and even more true of most of the writers’ workshops that seem to be highly approved. I’ve seen quite a few writers who did learn to write professionally through reading fee criticism, and many who shortened the long period of apprenticeship. I’ve also seen unknowns accepted almost instantly to full professional status–something they couldn’t have gained otherwise until they’d sold a pretty fair amount on their own. Richard Prather, for instance, was discovered from reading fee submission; as a result, he began his professional career with the advantage of a well-known agent. Of course, he was speaking as a former employee of such an agency and not as someone who paid the money and was discovered. But I’ve never seen the practice defended before. So naturally, with Unitech’s billionaire backer and new power handling methods giving them the idea of beating the Services to Mars–no need to stop on the Moon even, they were that good–they didn’t include spare linings. That’s from “Over the Top”, the aforementioned forerunner of The Martian. Patterns in science fiction seemed to indicate space travel would be conquered by individual tinkerers, then later stories featured the government. Will newer stories return to rich industrialists now that the rich informationalists are putting their money into it? I oversimplify, but this is a blog post, and not a dissertation. So maybe I remember more about the stories than I thought–I could pick the plot back up by reading a couple of paragraphs around the quotes I mentioned above. Perhaps it’s my instant recall that’s fading, or perhaps it’s the indistinct titles that don’t really tie into the plots of the stories that does it. More likely the former, but some of the latter. So worth a read if you’re into old school science fiction and/or the writing of old school science fiction, but you’d better plan to spend many man hours and calendar days on it. Previous Previous post: Won’t Someone Think Of The Soulless Automatons?